Finance Costs > How Much Does a Money Order Cost? Money orders are a fast and convenient way to turn cash into a check and is basically a check that is not connected to your bank account. They are ideal for those who don’t have a checking account, you’re worried about a bounced check, you need to mail money and/or you want to send a payment more securely. On average, a money order will cost anywhere from $0.70 to as much as $10. This will depend on where you get your money order. Refer to our table below to see what a money order could cost at various locations. For example, Walmart.com claims that a standard money order can cost $0.70. 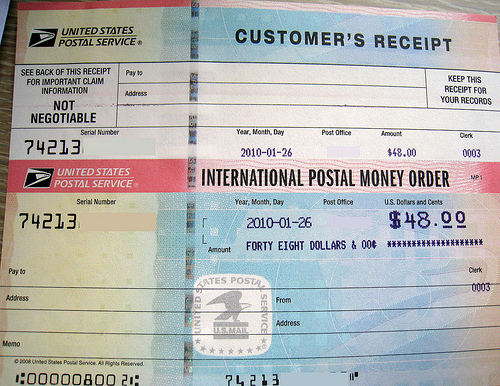 At the post office (USPS.com), a money order that is valued from $0.01 to $500 can cost $1.20, while a money order for $500 to $1,000 will cost $1.60. These prices are valid as of June of 2017. At the post office, if the money order is going to be sent to a military member, the cost can be as low as $0.40. Purchasing a money order online can cost as much as $5 to $10 per $1,000 needed. As noted above, a money order can be purchased at most grocery stores, convenience stores, pharmacies, check cashing stores, the post office and even online. However, you won’t be able to get a money order at a pouplar grocery store chains such as Aldi, Costco, Cub Foods, Farm Fresh, Food Lion, Giant Eagle, Sam’s Club, Save-a-Lot and Whole Foods. Money orders will always be valid and they will never expire. However, the only two people that can cash them are the person to whom it is written and the person who purchased it. USPS has a list of countries that can cash money orders. Similar to a cashier’s check, a money order will usually have a cap to how much you can put on it. While a cashier’s check is backed by a bank account, a money order will be backed by smaller organizations; because of this, some deem a money order as being less secure. The security that is offered by money orders is that this check will never bounce. With regular checks that are connected to your bank account, you can bounce a check when someone cashes a check you have written while you have insufficient funds. With a money order, there are guaranteed funds backing up the check. The post office and banks should have some type of watermark or seal on the money order to show that it is backed by an approved institution. Fraudulent money orders have been issued, so the post office or a bank is the safest place to purchase one. Single money orders will have a maximum limit that is usually around $1,000. So if you had to purchase $1,500 worth of money orders, you would have to purchase two separate money orders, which means you will have to pay for each one. In some circumstances, you can track a money order for a small fee. International money orders can cost an additional $3 to $6. Some companies, such as the USPS and Western Union, can replace your money order for a fee that ranges anywhere from $5 to $35. If you need to cancel a money order, it will cost you anywhere between $6 to $15 or more. For example, the USPS will charge close to $6 if you needed to cancel it, while the Western Union will charge you closer to $15. If you are insistent on getting a money order through a local bank, they may want you to have an account before they process it for you. For those sending money orders overseas, you may be limited to an amount that is less than $1,000. Usually, it is around $700. Talk with the business or person before handing over a money order. Because a money order can easily be faked, some companies will only accept a cashier’s check. In certain situations, the small charge of a money order is well worth it to avoid the risks of losing your money or bouncing a large check. Cashing a money order will always be free at your local bank or credit union as long as you’re a member; however, if you were to cash at a third-party, fees may apply for those who want to cash it. Always keep your receipt as a proof of payment. Alternatives to a money order can include a certified check, traveler’s check and/or wire transfer. Depending on your needs, you may want to consider other solutions to see if it fits your situation. Can you buy a money order with a credit card? Yes, you can purchase a money order with a credit and/or debit card, but if you were to use a credit card to purchase a money order, a credit card company will look at this as a cash advance and will charge you higher fees because of it, according to WalletHub.com. Try to avoid the banks if you want to get a money order for the lowest amount. Instead, consider a cheaper alternative such as the local post office or even a retailer such as Walmart. For larger purchases, consider getting a cashier’s check rather than a money order. As mentioned in the extra costs, you will have to pay a fee for every $1,000 or so. If your money order is for more than $2,000, it is probably best to look into local cashier check rates. To avoid going to a local store, consider sending money online via services such as PayPal. Here, money can be sent for as little as a few dollars.